Sun Drop soda has been around for decades, but it's largely been limited to Southern states. That is until its parent company, Dr Pepper Snapple Group, recently rolled out a national marketing campaign and began distributing the citrus-flavored soda across the country. You may have seen part of its new marketing efforts in a funny, new commercial that uses Snoop Dogg's 2004 hit song "Drop It Like It's Hot," which seems to have also become the company's new slogan. The girl dancing in the commercial is certainly dropping it--though I can't say that it's hot. But that's the intent and is what makes it funny. Sun Drop has long ties to this area. Sun Drop Bottling Company of Concord, run by the King family, has been distributing the soda since 1954. And in the 1980s and '90s, NASCAR legend Dale Earnhardt endorsed Sun Drop, causing race fans all over the South to chug it because he said so. Now, the new incarnation of Sun Drop is getting a little more hip and adjusting with the times. As you can tell by the commercial, which uses a hip-hop song as its theme and uses Fatman Scoop to narrate it, the brand is going after younger drinkers to try to compete with Mountain Dew. Its marketing is being handled by Scratch, a new marketing division of MTV. 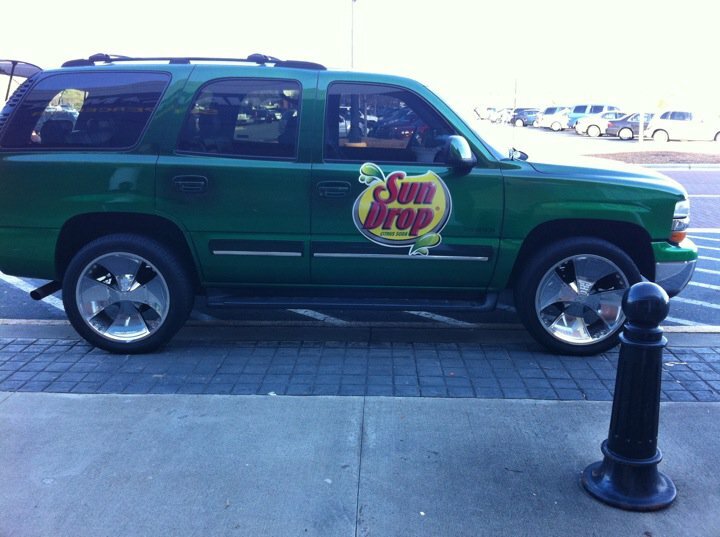 No Limit Larry drives the Sun Drop whip and gives away soda and prizes. Locally, Sun Drop has partnered with Power 98, and radio personality No Limit Larry is hosting Sun Drop Fridays, where he sets up shop at a particular business and gives away free soda, T-shirts, and other prizes. He tries to get people to "drop it," and he and his caravan will be at the Walmart on North Tryon Street this Friday, 4-6 p.m.
Below is the Sun Drop dancing commercial. For more on Sun Drop, visit its newly redesigned website at www.sundrop.com. If you have memories of drinking Sun Drop, post them below in the comments. Who is that girl she can really drop nawt to be racist, but she's good for a white girl!